Ceremonies associated with the Bush Yam are widespread throughout Central Australia, celebrating the importance of this native food and recognising its ritual importance. When large numbers of people have gathered together for ceremonies and Law business, the critical issue in the desert is finding enough food to feed everyone. The Dreaming or Jukurrpa Stories that relate to Bush Yam can focus on its propagation to promote abundance, and can also reflect on the traditional obligations to equally share access to food. The Warlpiri Creation story that comes from the Yumurrpa site, north of Yuendumu on the edge of the Tanami Desert in Central Australia, is one example of this. The Ancestors of the Yarla or large Bush Yam were in conflict with the Ancestors of the smaller Wapirti white Yam. They fought a pitched battle over the rights to the site where the Yams were created at Yumurrpa, and therefore were fighting over access to these mainstays of bush food. The custodians of the site maintain the ceremonies that record this battle waged by their Dreamtime Ancestors, and recognize the message that their Ancestors are telling them. This is a message of fairness of distribution of food, to avoid creating violence and disruption in society. Lorna Napurrula Fencer painted some of the great Warlpiri paintings showing the Dreaming origins of the Yarla and Wapurti Yam stories. Some paintings show the spreading vine-like leaves of the Yarla plant, creating a web emanating from the tuber roots that are of the Bush Yam itself. The colours are chosen from the different seasons of the year and often show yellows, oranges, reds and greens along with other vivid and contrasting colours. Lorna Fencer also shows the Wapirti White yam, the water source at Yumurrpa where both the yams were created in the Jukurrpa Dreaming story, and the Big Yam conflict between the warring Ancestor spirits. The Yam story is well represented further south on the Utopia Homelands of Central Australia, where the artists show the ceremonial links of the Anmatyerre people to the Yam as a source of sustenance in the desert. 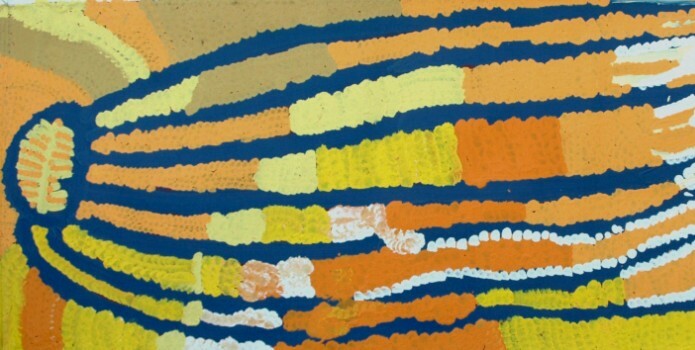 Artists like Emily Kngwarreye, Galya Pwerle, Gloria Petyarre, Jeannie Mills Pwerle and Rosemary Petyarre have established their own styles of paintings of the Yam and the women’s ceremonies associated with Yam Dreaming. Their depictions of the Yam Seed and Yam Flower are aspects of interest in the fertility of the Yam plant, and the paintings serve as the ceremonies do also, to celebrate and promote the abundance of the Yam.